The Most Rev. 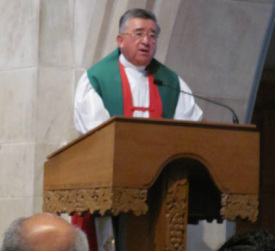 Martín Barahona, Bishop of El Salvador and the former Anglican Primate of Central America, received an honorary doctorate on May 16, 2012 during the 190th Commencement Exercises of The General Theological Seminary in New York City. The Bishop was recognized for his historic advocacy "for the rights of women, LGBT persons and those in economic distress" per a May 14 press release issued by The General Theological Seminary.